Last Saturday I headed down to another little local bloggers meet which was a rather fabulous picnic, again arranged by the amazing LittleEllieMae. The picnic was held in a local park in Plymouth which I frequently take outfit pictures in (you can see my last one here! ), with everyone bringing their own goodies to eat we just had to hope that the weather would hold out for us! The first ever Plymouth meet up I did was at Lush last summer and at this point Plymouth had about 6 bloggers to their name, there’s now around 50 bloggers that I have been in contact with in some way and it’s great to see our local community expanding so much, I only knew a few bloggers at this event that I had met before so it was lovely to get chatting to some others with similar interests. Ellie had set up a lovely gazebo which was rather lucky as the heavens decided to open on a couple of occasions, but it definitely didn’t dampen our spirits! It’s not really a picnic without lots of scrummy food! Everyone chipped in with the food and we definitely didn’t go hungry, Ellie also came up with the idea of a blogger bake off so I spent my evening before whipping up a delicious lemon drizzle cake – which was delicious if I do say so myself! We even had delicious pink lemonade made by Ellie, it looked so pretty and tasted pretty amazing too! Kim is an apprentice baker and put together this amazing lemon & raspberry flower celebration cake which you can find the recipe for here if you are brave enough to attempt this masterpiece! The effort that was put in was notable and was beautifully decorated with flowers and macaroons – Kim was a clear winner and definitely deserved her little prize! I can confirm that the cake tasted like a dream too! The picnic had never been so quiet when we were all tucking into our cake so it was perfect timing for Megan to serenade us with the sweet music of her ukulele!You can also spot my yummy lemon drizzle cake in the tin – yum! We finished off with what was a lovely afternoon by taking a group shot. A picnic was one of the most relaxing blogger meet ups that I’ve been to with enough time to spend chatting with everyone who was so lovely! So, thanks again Ellie for organising yet another brilliant meet up, I can’t wait for the next! 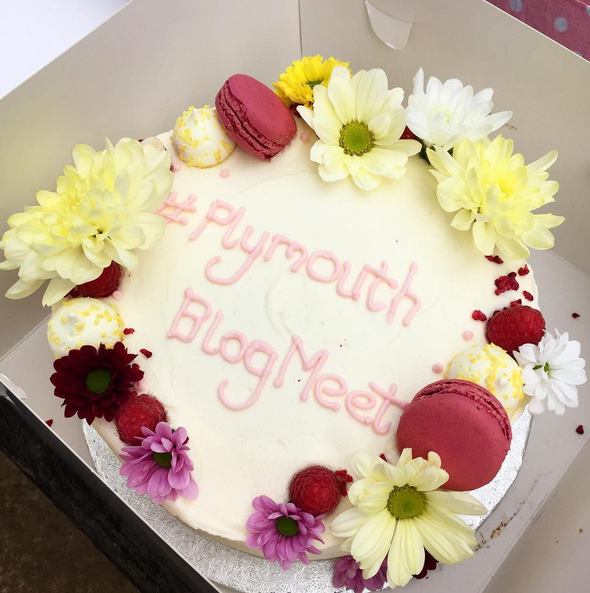 Have you been to a blogger meet up recently? What do you think of the show stopper cake?! Send me your links to read if you also went to this meet up!